"With a sensual start guaranteed to drag you hip deep into the storyline Jordan's Quest will soon find a place beside your keepers." "4.5 Hearts! It's a joy to discover an author who writes paranormal romance with a different twist. 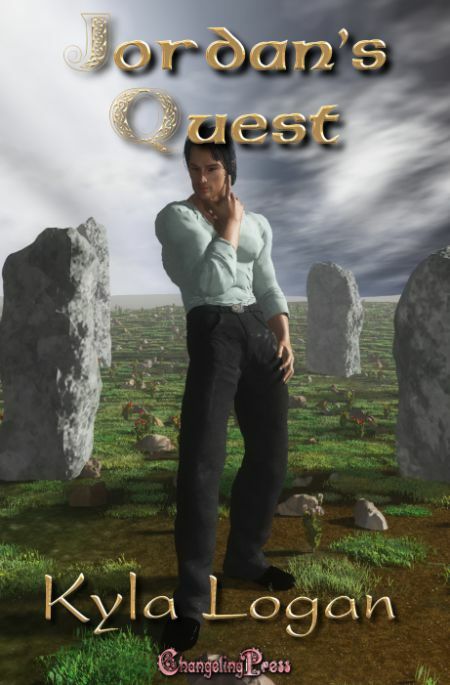 Jordan's Quest is rich in detail and arouses all your senses with the mating of Jordan and Micaela." Jordan McCabe is proud of the accomplishments he and his fellow Ainen have achieved over the past five years. They have followed the instructions from their goddess, Aine, and the first laboratory has been built. But there's something missing from his life. The instant he glimpses his latest employee he knows she is his long awaited lifemate. Dr. Micaela Annan is delighted to begin her new job at Ainen Industries and for the opportunity to at last work on her unusual theories for energy sources. However she didn't expect to discover that her employers are not human -- or for her inner wolf to immediately claim one of them for her own. Micaela followed the secretary upstairs. She wasn't all that impressed that the big shot, McCabe, had bailed out of her interview. She had been the one to request an interview today instead of tomorrow, but still, he could have made an effort to be here. As she passed one office she was assailed by the most delicious scent. There was no name on the door. Before she could ask, the secretary interrupted her thoughts. "This is Miss O'Brien's office, Dr. Annan. Please wait here for a moment." Micaela raised an eyebrow as the woman knocked on the door and opened it after being invited to enter. "Dr. Annan is here for her interview, Miss O'Brien." "Well, show her in, Janet. Don't leave her standing in the corridor," a soft voice answered in an Irish lilt. Micaela stepped forward so when Janet turned she beside her. "Oh," she gasped. "You gave me a fright! I didn't realise you were so close. Just go in, Dr. Annan." Micaela murmured a thank you, and walked around the secretary. The woman who stood at the front of her desk was a surprise to her. At least five feet ten inches, she stood well above Micaela's own five-five. Her waist length black hair was clipped back at the temples with combs. It was a style that suited her oval shaped face and high cheekbones. Micaela was aware that the woman was busily cataloguing her own figure, and smiled as she caught the other scanning her face. The answering grin told her this woman could become a friend. Walking toward Micaela, she held out her hand and said, "Welcome to Ainen Industries, Dr. Annan. My name is Aislin O'Brien." Micaela shook Aislin's hand and was surprised at the strength in her grip. Normally a limp handshake was all she received at interviews. There was something likeable about this woman. "Please sit, and we can have a chat." Aislin indicated two padded chairs with cups and a coffee pot set on the little table. "Do you take cream and sugar in your coffee?" "Nothing, thanks. I prefer it black." Micaela waited until the cup was in her hands, and Aislin was seated opposite her before saying anything else. "Your secretary mentioned that Mr. McCabe wasn't available for my interview. Does that mean that I'm being politely told that I won't be interviewed after all?" "No! Of course not! Why would you think that?" Micaela could smell the surprise from her interviewer at her question. "Please, call me Micaela, or Caela. I had to ask. I didn't want to waste your time or mine." "I knew that I was going to like you, Micaela." After they'd both taken a fortifying drink from their cups, Aislin began asking her questions about her theories of alternative, ecologically friendly fuel sources. This was a subject close to Caela's heart. To find an employer actually looking to develop this type of research was amazing as far as she was concerned. She explained how far her research had taken her in using natural carbohydrates as a fuel source. She was impressed by the questions Aislin asked in response to her hypothesis. "So you feel that with proper funding and these facilities at your disposal, you will be able to create a viable fuel cell by using carbohydrates, namely sugar cane and cassava?" "Yes! There is no doubt in my mind that this is the way to go forward. But I can't stress enough that this process will not be achieved tomorrow. It will take intensive research, more than I can continue to do on my own time. Most of my theories are assumptions based on minimal experimentation." At least Aislin hadn't laughed when she laid out her ideas. It wouldn't have been the first time, but somehow she got the impression that everything she said was greeted with real interest. "If we were to offer you a contract to begin your experiments here at this facility, when could you start?" "Immediately. There's a clause in my present contract stating that if an employer offers me a chance to work on my theories for this type of fuel then I could leave without giving the normal notice." Taking a breath she grinned as she continued, "I knew they laughed behind my back when they agreed to this, but maybe the last laugh will be now mine." Laughing, Aislin asked, "When can you start?" Swallowing down her tears of joy, Micaela told her, "A week from Monday." Caela left the building after confirming a few more details. Once more walking past the doorway to that most intense scent, she wanted to stop and ask who the office belonged to, but that could wait until she started work here. It would be something to ponder over, because she had the strangest feeling the owner of that scent was her mate. But there was something even more bizarre. She didn't think that Aislin O'Brien was human. So the question was… if she wasn't human, what was she?